Mine was busy to say the least. So I'll do a short, little recap. Friday- Justin and I met up with his high school friends for an unfortunate circumstance. A United States Marine was killed in battle on June 3rd. It was one of Justin's close friends, Paul Zanowick. They had a wonderful viewing for Paul. We waited in line to pay our respect for four hours. He was very loved and will be terribly missed. I'm keeping his wife, son and family in my prayers. It makes you realize how blessed you truly are and how much you can take life for granted. He gave his life for our country so we could live, Paul is a true American hero. After the viewing we had dinner at Champs with all of Justin's friends. It wasn't as fun as usual considering the circumstances, but the food was delicious. After my very nutritious and balanced breakfast, Justin and I headed over to our house to get some work done. While he was cutting our grass it all of a sudden hit me that in a matter of weeks this is going to be my reality. I'll be a wife. I'll be married. I'll be a newlywed. It's so crazy to think about. My entire life is about to change! The Roommate was SO weird and creepy... Leighton really plays a good psychopath. Sunday- BUSY.BUSY.BUSY. All I got to sayyyyyyyy. We're getting ready for our block garage sale this week. Everything in my room is for sale. So I spent the entire day organizing, cleaning, sorting, pricing... etc. I was so happy they found them! Would it be corny to put them on our display table at the wedding? The entire month of June, July and August are going to be packed with fun and exciting things! I can't wait to share everything with you guys! aww they're so cute and the 80s/90s style is adorable! I had that exact same ken doll growing up! What a stud. haha. So exciting about your upcoming wedding! Married life is just awesome and I bet you can't wait to start that new chapter. Good luck with all the last details. 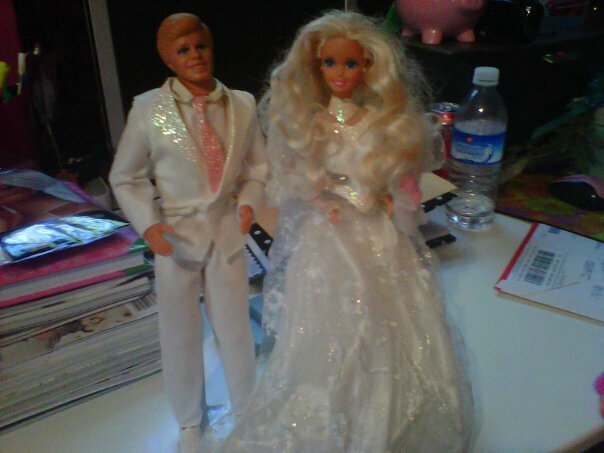 Hahaha I love wedding Barbie and Ken. It would be a *little* corny to put it on the head table, but maybe you could put them on the cake table or the bar or something? Make it a "funny" thing. Thanks guys! :) I think i'm going to display them at my shower instead! :) haha... less corny! the ken and barbie are hilarious! I LOVE wedding blogs... even though I don't even have a bf.... I am still totally going to follow yours! Sorry about the loss... funerals can be so tough... but it's great to have a support system around. Oh and pasta for breakfast is a-ok in my book... as are M&Ms for breakfast. LOL I think you should display them...how funny!